The Ministry of Culture analyzed on Friday in Luanda, aspects concerning the preparation of the Biennale of Luanda , a Pan-African Forum for Culture of Peace to kick off in the second fortnight this year. The meeting, in which the national coordinator of the biennale was introduced, Alexandra Aparício, discussed issues related to the programme of the event to be held in the ambit of the agreement signed by Angola and UNESCO in December 18 of 2018 in Paris. Will UNESCO once again play a role in the culture of peace? For the execution of the activities slated for the biennale, the Culture minister, Carolina Cerqueira, stressed the need for the involvement of all sectors of the society, mainly the staff of the sector, representative of the civil society, artists, writers, associations, cultural groups, show makers and journalists. The programme can also include discussions on the role of young people to combat corruption and woman’s protection against domestic violence, resolution of conflicts and the challenges to bolster dialogue and friendship amongst peoples. 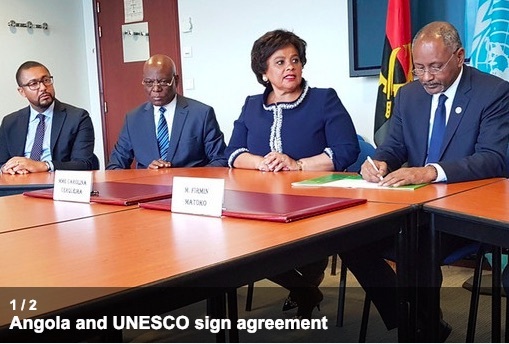 The holding of the Biennale of Luanda shows the political willingness of the Angolan government to establish a closer cooperation with UNESCO, with view to promoting a true culture of peace in Africa and represents the recognition of the country’s example of strengthening peace and national reconciliation. The event will also count on the support of the African Union.